Kanhaiya Kumar’s arrest for sedition in Delhi is a violation of his constitutional rights. The actions of the Indian Government and the Delhi Police last week against students at the Jawaharlal Nehru University (JNU) in Delhi violated the fundamental principle of free speech and expression in the world’s largest democracy. A video of Kumar chanting Kashmiri separatist slogans at another event at JNU two days prior then began to circulate online, fuelling support for “anti-national” and seditious charges against Kumar. The event commemorated the hanging of Afzal Guru – a Kashmiri separatist who was convicted for his role in an attack on Indian Parliament in 2001. The video appears to have been doctored. Kumar had no role in the organization of that event, nor did he speak at it. Members of the government and sections of the media briefly played up allegations that Kumar and another student present at the pro-Kashmir gathering worked for terrorist groups. They backed away from these claims once they were proven false. Even if Kumar had played a larger role in organizing pro-Kashmir event or chanted “anti-national” slogans, however offensive, a claim of sedition is still a stretch. Kumar’s alleged words needed to have an active, direct, and imminent incitement to violence, which India’s Supreme Court has repeatedly ruled must be present to be constitute sedition under Section 124A. When Kumar’s sedition case was taken to Delhi’s Patiala House court to be heard after his arrest, he, along with journalists and other JNU students, was physically attacked – punched, kicked, and dragged, while Delhi Police stood by and failed to intervene. No action has been taken against the attackers, who included a BJP member, and lawyers with close ties to the BJP, despite these incidents being caught on camera and the videos (not doctored, on this occasion) being widely shared. The Indian government has stood by these appalling actions as events have unfolded at JNU. Rajnath Singh, Home Minister, wrote on Twitter: “If anyone shouts anti India slogan & challenges nation’s sovereignty & integrity while living in India, they will not be tolerated or spared.” Smriti Irani, Education Minister, told reporters, “The nation can never tolerate an insult to Mother India.” Prime Minister Narendra Modi has remained deafeningly silent, as the country he governs has erupted into a heated and divided debate, and Kumar is still in jail. His bail plea will now be heard in the Delhi High Court on Monday. This abusive stifling of dissent must never be tolerated in India, no matter which party is in power. Anyone who is found to have been involved in the doctoring of videos to malign Kumar, along with the lawyers and BJP affiliates who physically attacked students, teachers, and journalists at the Patiala House court, must be brought to justice. Uzra Khan is a Master in Public Policy student at the Harvard Kennedy School. She is a Shorenstein Center scholar for media, politics, and public policy and Editor-in-Chief of the Kennedy School Review. 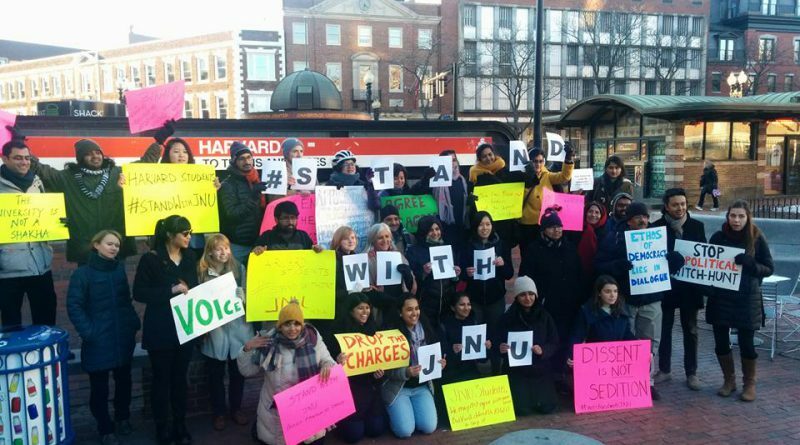 Photo Credit: Protesters for JNU at Harvard Square, taken by Meera Srinivasan.